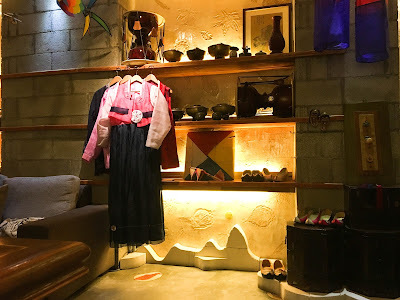 Makan-Makan: Sweetree Korean Restaurant | Teefa Says..
My sister-in-law is a huge HUGE K-Pop fan. When we asked where she wants us to treat her for her birthday, Korean food is the natural answer. This time, we went to Sweetree. Sweetree is the only JAKIM-certified halal Korean restaurant in Malaysia. It's located in Ampang (i call the area 'Little Korea') so it's very convenient for us to get there from Wangsa Maju. 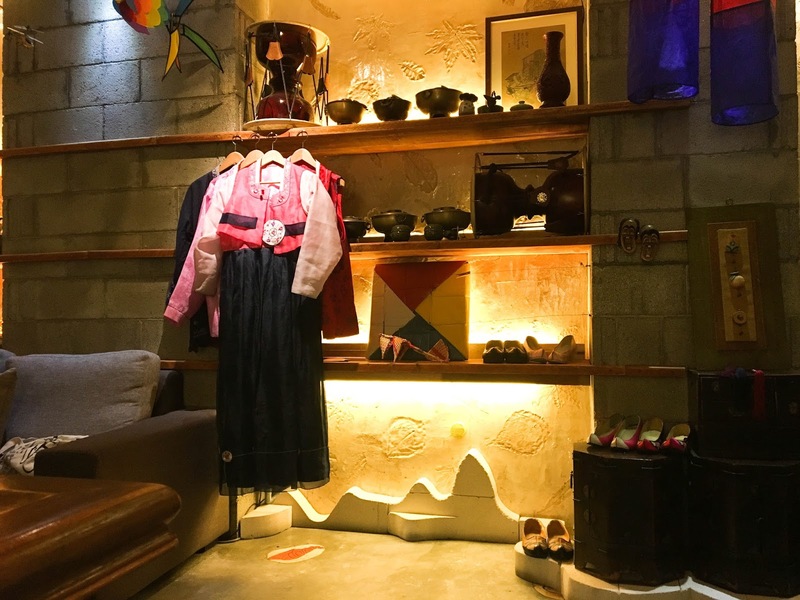 The shop is 2-storey and the interior is very quirky, giving a cute-Korean ambiance. We were greeted in Korean by the friendly staff, i feel like i'm in Seoul already. There were not that many people when we arrived but at around 8.15pm, the place is packed with people, mostly Muslims. Wow Korean food really is the in thing right now eh? Even with the restaurant almost full, service was fast. We only had to wait 5-10 minutes for our drinks and foods to arrive. We were served with a bowl of plain porridge with a little bit of what I assumed as kimchi sauce and various condiments. 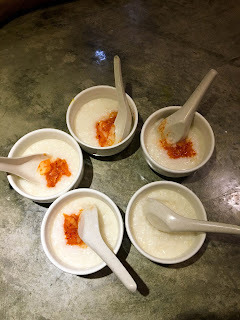 The porridge is rather plain and bland (which is suitable for babies and kids) but eating it with condiments were yums! Farah's Jjangmyun was not my cup of tea. It tastes a bit like mee hailam with teochew. 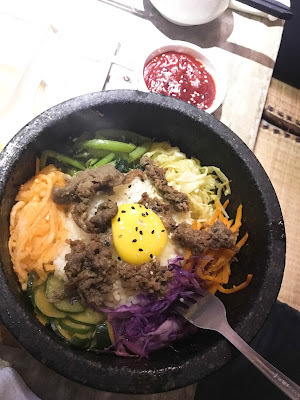 I love the Dolsot Bi Bimbap but be careful when adding in the spicy sauce. Pedas! Nasib baik tuang sikit-sikit. I ordered Gal Bi Jim which is short ribs braised in soy sauce (basically rusuk masak kicap versi kering la ni). The ribs are soft and tender. I just wish it's a bit soupy. Takde la kering je makan ngan nasik. The Korean pancake is marvelous, I'd recommend! If you're not a fan of Korean food, there are also Malaysian dishes in the menu. We ordered Mihoon Goreng for Wan and Mihoon Tomyam for Makngah. 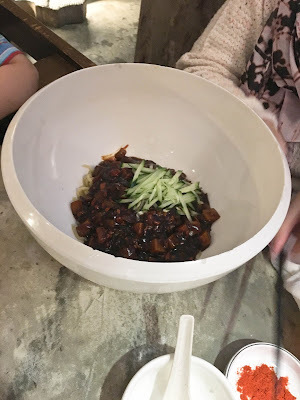 Noodles in black bean sauce with minced chicken and cucumber. Mangkok tu legend. Besar macam pasu bunga! Warm rice topped with cooked veges, beef, eggs and served in hot stone bowl. It stays hot til the dish is all finished. One of the many decoration on the first floor. Posing with the pretty noona! All in all, I'd recommend Sweetree if you're looking for an authentic Halal Korean food. Friendly staff, prompt service, delicious food all checked! If only they have a small children play area i'd be ever so happy.. Happy International Cochlear Implant Day!